I’ve been unceremoniously summoned back to the tarot blog hop–and I’m happy to be here, too! Why did I ever stop doing these? So anyway, today is the first day of spring, AND the moon is as full as an EGG! 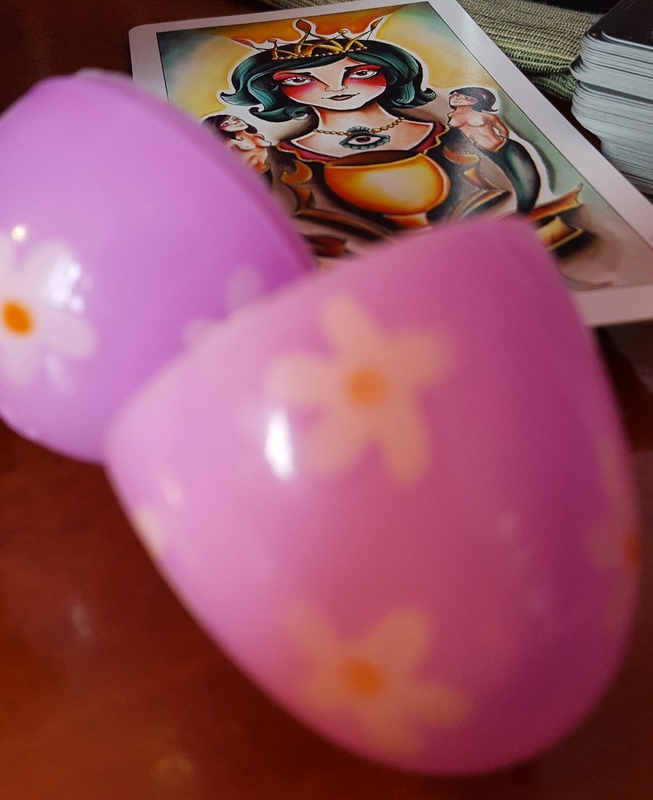 Our theme this time (or at least, the one I chose from our two options) is to imagine cracking an egg to find a secret ingredient, represented by a tarot card that we have randomly chosen–the secret ingredient, that, as I interpret this prompt, represents our secret sauce for spring 2019. And it might also be an ingredient for a recipe–literally or figuratively. Better be a darn good ingredient, given that 2019, numerologically, adds up to 12, the Hanged Man–that time in which, really, it’s like we are in an egg, incubating, waiting, to hatch. You’ve probably guessed from the accompanying photo that I picked the Queen of Cups from the Tattoo Tarot. This doesn’t surprise me, first, because a cup is kind of like an egg, but also, because the Queen of Cups is me. I CAN be a Queen of Swords, but I have to push to do that. I am by nature more the Queen of Cups–that person who is kind and sweet (yeah, I know, it’s nauseating! ), calm and composed, with depths that may also be calm or may, in fact, be churning up support for an upcoming storm. That person who does too much for too many people and needs to work on better boundaries–or that person whose boundaries have been transgressed and who may throw a tantrum about it. That person who is also a queen: in charge of her domain and who can sit calmly with you, listening, and looking, over a nice cup of tea (or glass of wine). Yes, the Queen of Cups is all heart, but here’s the thing: while cups are watery, and this queen has plenty of watery depth, the heart’s element is fire. That’s why we need either a boiling hot cup of tea or a cup of something that actually can burn (alcohol). Beware the smooth surface of the sea, because what’s under there is calm partly because the Queen of Cups has already made up her own mind without any help from you, thank you very much. And you never know what might be swimming around in there! The Queen of Cups from the Tattoo Tarot, calmly gazing at you over her tea. So this is my recipe and my advice for this spring and for these very very volatile times: Look. Listen. Smell. Taste. Feel. Meanwhile, keep your own counsel and apply it to action. Cause one reason I’m not the Queen of Swords, right at the moment, is that sometimes, and now might be one of those times, the time for talk has passed. There’s a reason you have to watch out for the quiet ones, and it’s because we’re out there drinking cups of tea, calmly plotting our next moves, and saving our energy for the tsunami that will sweep away the status quo and clear the way for the work of the heart. We can do the work without the tea (or the wine). It’s just there to calm our nerves. And if our nerves need calming, the people around us are really the ones who should be getting nervous. I hope y’all know how to swim! Thank you so much for being apart of this cycle for the TBH, this deck has a somewhat cheeky energy about it. I love how you’ve allow some of you to shine through in this and I am really looking forward to seeing more of you in the cycles and hops to come. I love Stash Double Bergamot! One of my favorites. lol, yes, I guess the Queen of Cups can be scary–I don’t usually see her that way (or myself that way) but, in the right mood… lol.